Welcome to our China Adventure. On August 7th at 7:00 am we left Tulsa, Oklahoma aboard a United flight to Chicago, from here we boarded United Airlines flight 851 for Beijing. 14 hours later we landed to find "we weren't in Kansas any more!" Let me tell you nothing has been the same since! We were met at the airport in Beijing by my new boss Ms. Ma and our waiban Leanne. After sending the luggage (all 500 pounds of it) on to Jinzhou via the night train, we checked into a guest house. Sleep was fleeting as Charlie was up for most of the night. 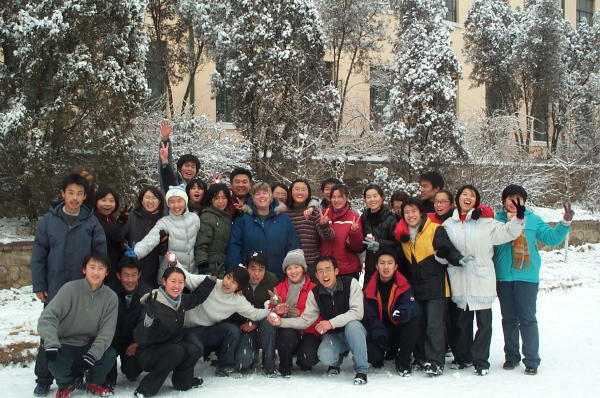 The next morning we boarded a train and 7 hours later we pulled into Jinzhou, Liaoning China. I have accepted a teaching position here in Jinzhou at the Liaoning Institute of Technology. I'll be teaching Oral English classes with 6 other teachers. Here I am with one of my Freshman Oral English Classes. We were er...ah.... gathering information for a paper I had them write called "my fun in the snow"
Yahoogroups will direct you from there.